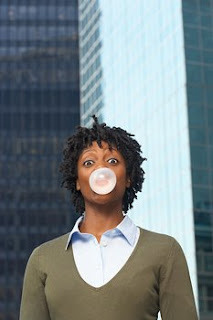 Orthodontist Dr. Judith A. Okun - Westchester and Rye Brook, NY: Chewing Gum - What's the story? Chewing Gum - What's the story? We know the rumors going around – that once you swallow a piece of chewing gum it will stake a claim and take up residency in your stomach for at least seven years! We really hate to take all the fun out of the mystery, but the truth is that chewing gum, when swallowed, will enter the stomach and move through the digestive system just like any other piece of food and leave the body long before seven years! So, if you ever have accidentally swallowed a piece of gum, there is no need to worry! This being said, gum does not have any dietary benefits, so while it’s not harmful to swallow, you still want to avoid swallowing it. If you are a gum-chewer, make sure you chew sugarless gum, because gum with sugar can lead to cavities. Sugarless gum still has the same amount of flavor, but with less cavity causing ingredients. You see, when the bacterium in your mouth breaks down sugar, what’s left behind is acid. This acid eats away at the enamel coating of your teeth, causing holes that we call cavities. Cavities can lead to other long term mouth problems if they are not treated in time, so it is best to try and avoid overexposing your teeth to too many harmful substances! Check out our other social networks! We are committed to providing patients with complete and comprehensive orthodontic care in Orthodontics & TMJ treatment in Rye Brook, New York (NY). Your first visit to our office enables us to become acquainted with each other, and allows you to experience our warm family atmosphere. We are board-certified orthodontists, and have been proudly serving the Rye Brook community for over 30 years! We focus our concerns on the comfort and well-being of our patients. We pride ourselves in providing complete orthodontic and TMJ (myofacial pain) care by incorporating the latest technology into your treatment, including the Electro-Acuscope/Myopulse System for pain management, traditional metal braces, clear braces, lingual braces, and Invisalign® (“invisible” braces). We also fabricate custom athletic mouth-guards to protect teeth and jaws from impact during sports and martial arts. When Are Two Phases of Treatment Necessary? Why Is It So Important To Have Straight Teeth?